Get a colour fix. 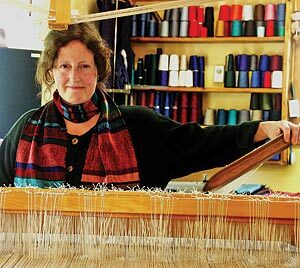 Hear the thump thump of traditional wooden hand looms or the clacking of the fly shuttle loom.. Watch our bare feet and hands creating original patterns. Notice that the building is made of straw bales. Feel the textures of one-of-a-kind natural fabrics designed with contemporary colours. Take home a wine bag or try twisted wraps and hats on while you talk to the weaver and the seamstress.